The SONITX GOLD FILTER provides over 94% Arrestance in a premium quality Extruded Aluminum, Gold Anodized frame with a durable finish. 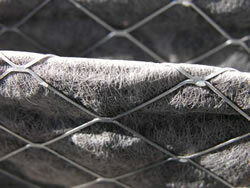 At the heart of this filter are three layers of high arrestance material sandwiched between 2 layers of expanded steel. 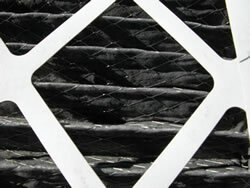 A special Impregnated black Polypropylene layer has an EPA registered anti-microbial material to inhibit mold and bacteria growth while the center non-woven layer retains debris in a maze of fibers designed to maximize air flow even when soiled. 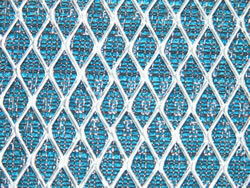 Rated by an independent testing laboratory at over 94% peak arrestance, this filter has 10 times the arrestance of a disposable fiberglass filter. The patented pleated filter we install as an alternative is electrostatically enhanced media with a MERV 7 to MERV 14 rating. This filter media utilzes "electro-mechanical" filtration that not only captures particles in a maze of fibers, but then "holds on" to the particles via an electrostatic charge. This reduces the unloading effect common with "mechanical only" box pleat filters that allows a lot of the contaminants to be pulled right into the coils when the unit turns on at each cycle. Don't be fooled into thinking a filter is a filter. While they all "filter" the air circulating through the air handler and subsequently through the building, some are much more efficient and thorough than others. 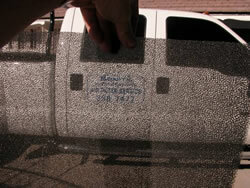 Arrestance is a term which refers to a filter's ability to trap airborne contaminants such as dust and mold. Our 5-stage electrostatic filter boasts arrestance that exceeds 94% which means that over 94% of contaminants were trapped during testing. Resistance is a term which defines how hard your air conditioner/heater needs to work in order to pull air through the filter. 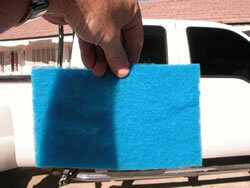 Filters with low resistance allow the air conditioner/heater to breathe more easily and to operate more efficiently. A good filter with low resistance will save you money and reduce repair bills when compared to a filter with higher resistance because your air conditioner will operate fewer hours per day. Our filter has an initial resistance of a mere .12 wg. at an airflow of 1200 cfm. The lower the number the better. Our 82% arrestance filters for larger industrial units consist of 100% non woven electrostatic media with a .08 wg resistance at 1200 cfm!!! We have filters starting at .02 wg for less critical situations that can save energy costs when higher filtration is not necessary to protect the equipment. We ordered an electrostatic filter from a competitor, took it apart and this is the filtration media we found inside. This filter was recommended on an allergy website. Just how many allergens could this filter possibly capture? Here is the electrostatic filtration media from inside one of our filters. Which would you rather have cleaning your air? 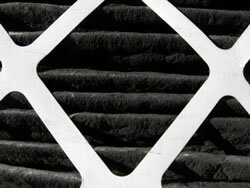 This pleated paper filter was located in a commercial garage where outdoor air frequently came in as the large garage door opened and closed. This filter was only in place for 30 days and became this filled with dirt. This is the back side of the same filter. Notice how the dirt has infiltrated the filter to the point that even the back side is saturated with dirt. A close up of the back side reveals that dust has made its way through the weave of the paper and now the dust is being pushed out the back. Movement such as the filter moving back and forth as the fan turns on and shuts off shakes this dust off and into your coil. Over time this will clog your coil. Clogging the coil will reduce the efficiency of the HVAC unit, increase power consumption and will eventually cause the unit to fail. Here is the backside of one of our filters after 2 months of service. Can you see the difference. 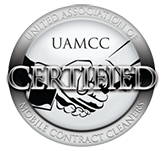 Our full inch of filtration makes our filters highly effective at stopping dirt and dust before it has a chance to harm your equipment and cause your electric bills to skyrocket.